Herd of cows grazing in a green field. Aerial shots. NOVOSIBIRSK, RUSSIA - JUNE 30, 2017: Two breeders are on the wheat field. Cows playing in a field of grass flooded by a dense haze near a forest. Nordic wildlife in Summer. Scandinavia. Colorful fish swim through aquatic plants in an aquarium in 4k. Close-up represents exotic pet stores, hobbyist breeders and marine life affected by climate change. Fish swim in a freshwater aquarium in 4k. Aquatic plants surround a decorative skull at the bottom of the water. Medium shot represents exotic pet stores, hobbyist breeders and marine life affected by climate change. Beautiful Puppies Running in Field of bright green grass after being poured from a brown wicker basket on a warm day. Cute Dog Litter Video for animal breeders. 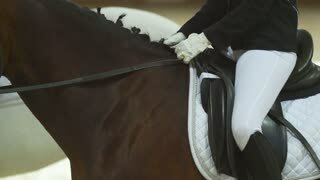 Coach teaches the horse to run with a whip and a long rope in the arena at the racetrack. Slow motion. Training for horse riding. Girl is teaching a black horse to run around in a circle on a horse farm in the fall at sunset. Slow motion. Horse riding, Racecourse. As depicted in 1939, breeder Charles Howard seeks for an up-and-coming horse to add to his stable in the early 1930s. Female rider trains a horse at a racetrack holding her by the reins. Slow motion. Woman hold horse on leash while running in circle. Training a horse. Zavkhan, MONGOLIA - July 16, 2017. A young bull-calf, a cow and calves, a woman is a milkmaid, a cattle-breeder's way of life. Summer cloudy morning. Herd of cows grazing in a green field. Aerial shots on low altitude. Herd of cows grazing in a green field. Road in background. Herd of cows grazing in a green field. Low altitude aerial shots. Flying low over the herd of cows grazing in a green field.